For improvement of fuel properties, it mixes by various components, which influence on the chemical and physical processes of fuel. These components improve to the same extent different operational properties and their indicators. With a choice of components composition, special attention should be paid to compatibility with applied oil for greasing. Fuel combine more often is compatible. In this case stability of a mix of fuels isn’t broken and the intensive deposits don’t occur as oil fuels represent the difficult organic mix mainly consisting of paraffin, naphthenic and aromatic hydrocarbons. The fuels containing hydrocarbons (generally distillate oil products), form the stable mixes close on perfect solubility. The most important economic problem for refiners is the best ratio of components for production of a final ready-made product. Mixing is more difficult process, than a simple combination of components by hashing. The correct fuel combine is an important aspect for the limit productivity of petroleum. Incorrect mixing can lead to division with other components modern automobile petroleum can be received from more than 10 various streams of hydrocarbons, each influence on the final specification and a total cost. Mixing of components can be carried out with application of various processes, such as linear mixing in the manifold, mixing of parties in containers using blending systems and observance of technology leads to optimum results. Line mixing of gasoline, distillates, jet fuel, kerosene it is carried out by introduction of proportional quantity of each component in the main stream where process of cavitation promotes their careful mixing. Additives and components which increasing octane number of gasoline, antioxidants, inhibitors of corrosion and gumming and etc. added in time or after mixing for ensuring the concrete properties. 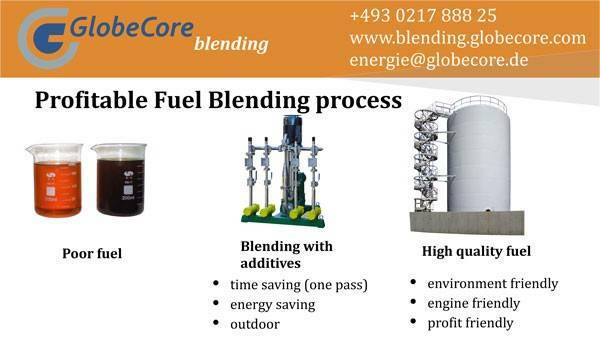 The GlobeCore Blending company is engaged in a mass production of fuel combine systems of various liquid components. The way and technology of processing in a subsonic stream provides change of processed liquid structure. Hydrodynamic ultrasonic systems “USB” are developed by the individual order, and components of fuel combine system get out on the basis of need to conform to requirements of your work, whether it be at design of new system for mixing with the minimum difference of pressure, or at development and deployment of a new control system for existing infrastructure.